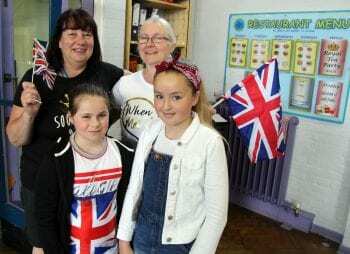 Newington Community Primary School became Red, White and Blue as Newington School for the day to celebrate the Royal wedding. 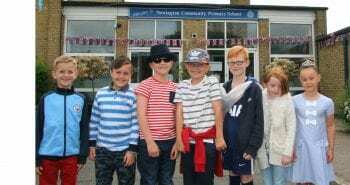 Patriotic pupils and staff wore red, white and blue clothing for a non-uniform day and raised around £500 for children’s cancer charities. 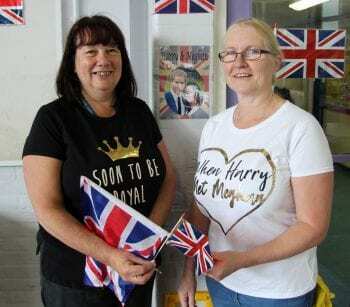 The celebrations for Prince Harry and Meghan Markle’s big day started as pupils approached school with the outer reception entrance decked out in union flag bunting. 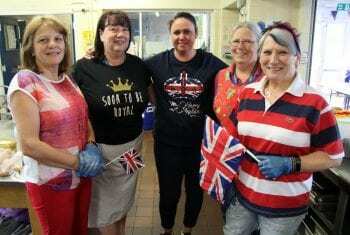 The school restaurant and catering staff were also in the grips of Royal wedding fever for breakfast with the kitchen team sporting Harry and Meghan tops, while the serving area and walls were adorned with more colourful bunting, union flag posters and pictures of the Prince and his bride. A special Royal wedding party at lunchtime for the whole school included a traditional picnic menu for children plus ploughman’s lunches for adults. Small cakes were topped with either the union flag, a picture of Harry and Meghan, or a romantic love heart. The pivotal moment of the celebration was the singing of the school song ‘Ambition, Achievement and Aspiration’ followed by a rousing rendition of ‘God Save the Queen’ and a huge cheer. “It is very important for our pupils to understand the history and heritage of our country and the Royal family and associated events are a huge part of that.